Make a large batch, and store the leftovers (if there is any) in meal sized portions to pull out of the freezer in January or February for those nights when you don’t know what else to cook. This winning recipe will soon become part of your family’s favorite keeper recipe file. Like any soup or stew, the flavor vastly improves if the stew is stored overnight in the refrigerator before re-heating. Lightly brown the onions in the oil and remove with a slotted spoon and reserve. Pat meat dry between paper towels and brown it on all sides in the same pot without crowding. You may have to do it in batches. Sprinkle browned meat with flour, salt, and pepper. Add wine, garlic, stock, tomato sauce and herbs. Over heat bring the mixture to a simmer and then cook it, tightly covered for two or more hours or until the meat is fork tender. Add the pearl onions after one hour. If using chopped onion, just let them cook with the beef and stock. Meanwhile, wipe the mushrooms with a damp cloth and trim off stem ends. Quarter mushrooms if large, leave small ones whole. Heat the butter and remaining oil or butter in a large skillet and lightly saute the mushrooms for about 4 minutes and set aside. When done, skim off any fat and add the mushrooms. Voila! Beef burgundy! After cooling, it can be refrigerated or frozen at this point. 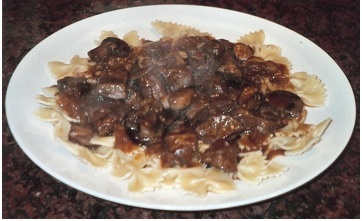 If the sauce is too thin, combine 2 TB flour with 1/2 Cup water and whisk the mixture into boiling beef burgundy. Serve over noodles or brown rice.